Hippy Tops come in bright colours and unique designs. Our tye die strappy tops are stretchable, unique and fit many sizes. Our long and short sleeved tops are suitable for all your festival or day to day needs. 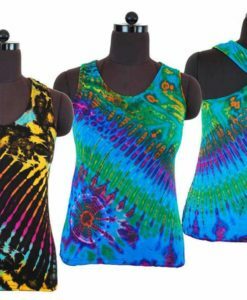 Check out the Strappy Lace Tie Dye Hippy Top – these can be worn with leggings or as a very short dress for those risque hippies among us! They come in 2 sizes, are made with stretchy material accross the back and 5 lovely colours with unique panel designs. Why not pair a Hippy Top with a pair of our Hippy Trousers to complete the look.